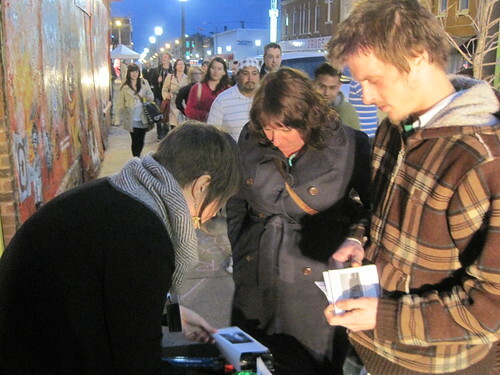 Emily Hemeyer helps two people assemble their zines at the Mythory Tour. On Friday, as part of the epic Southern Graphics Council (SGC) Convention night on Cherokee Street, the St. Louis Mythory Tour made its debut. An expanded version will return soon, as will a new edition of the ‘zine guidebook, printed in a limited edition of 70 for Friday. The built environment of St. Louis reveals itself through our observations, often clouded by nostalgia, ideology and comparison. We look around us and see inscriptions of what we imagine St. Louis to be, be that a “red brick mama”, an emergent Rust Belt powerhouse, a faded imperial capital or simply our home. St. Louis offers back its own narrative mythologies, presented through chains of linked sites with collective meanings. We quickly find that the city’s own presentation of itself is as veiled as our own observation. There is no one St. Louis, but there is no one archetypal St. Louisan. The Mythtory Tour imagines a landscape of accrued building that has been neglected, in physical form and human consciousness. This tour presents one possible mythology of place centered on traditions of construction converging across disparate neighborhoods and many generations in order to show us St. Louis. Whether you can find this city out there is irrelevant, because using this map you will find some city worth your love and respect. This entry was posted in Benton Park, Carondelet, Cherokee Street, Marine Villa, North St. Louis, Pruitt Igoe, South St. Louis. Bookmark the permalink.